Mirah Belle introduces unadulterated, pure essential oils that improve the health of your skin, hair and body. These 100% Pure Essential Oils offer a variety of benefits from cosmetic, dietary purposes and are known for their healing effects mentally, physically and emotionally. 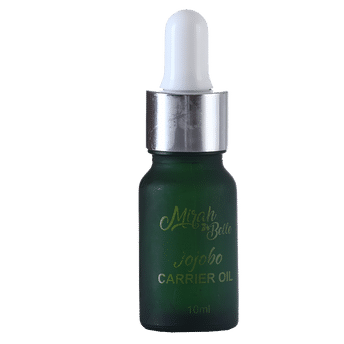 Mirah Belle's Jojoba Essential Oil has amazing health benefits. It keeps hair and skin well moisturized and forms a protective layer over it. It is suitable to be used on skin and hair. Jojoba oil for the hair: The Jojoba oil has properties similar to that of your scalps sebum. It takes on the natural oils job and keeps your scalp moisturized. Jojoba oil smooth's down the cuticle and forms a protective layer on the hair shaft, thus keeping the moisture locked in. Jojoba oil for the skin: As we know that the texture and use of the jojoba oil is very similar to that of your own skin, and as we age the skin produces less and less of the sebum. The jojoba oil helps in keeping our skin well moisturized and leaving it soft and supple.